Beginning at a very early age, children demonstrate an innate curiosity about and love for nature. Young children are fascinated by living things, great and small, and enjoy being out-of-doors in natural settings. The “ideal” environment for teaching about living things and the environment is one in which student interest is piqued and remains that way, rich resources are at hand, and both the required time and teacher expertise are available. A unique opportunity to create just such an “ideal” environment occurred at New Liskeard Public School in 2005 with the opening of a new dedicated Primary/Junior natural science room. The Ontario North East District School Board has invested heavily over the last three years in hands-on learning for its science programs. When reviewing the needs of our school, the board felt that this kind of science lab would enhance our ability (we are the board’s largest elementary school) to offer a top-notch program. Auspiciously, the architect for the project, Barry Martin, was keenly interested in science education and wanted to create something special. During the design phase in 2004, I was asked for input concerning the speciﬁc layout of the room and the stocking of the new science facility. The science classroom measures a little over 10m x 10m with an attached solarium measuring 4m x 10m. The classroom has a lab countertop along one wall with four sinks and glass-door cabinets above. There are numerous display cases, two computers, and many aquariums and terrariums. The solarium has high-intensity grow lights, a potting bench, numerous plant stands, and a large basin sink. All grade 1 to 6 classes come to me, as the Primary/Junior science teacher, for science. This teaching and room assignment enables our school to concentrate all of our science resources into one place. For our students it means that sci- ence is permanently on display – not something that is “pulled out of a box”. A dedicated science room has the advantage of allowing students (and teachers!) to set up experiments and leave them running if we need extra time. All materials are close at hand; extra sinks make clean-up easier. Living resources enhance many of the life science strands. Students can watch our plants and animals grow day by day, and year by year. In the case of spring butterﬂies and our ﬁre-bellied toads, students have witnessed the completion of entire life cycles – from eggs to adults. Our science facility is home to a large collection of living specimens. On entering the room for the ﬁrst time, students’ faces light up! They are confronted by our bearded dragon lizard, Buffy the Cricket Slayer; Charlie, the dramatic chameleon; our resident turtle, ﬁre-bellied toads, salamanders, and numerous colourful ﬁsh. The display cabinets showcase tropical butterﬂies, exotic insects, and replica dolphin, gorilla, and dinosaur skulls. Going into the solarium, students ﬁnd well over 30 plant species including banana, ﬁg, palms, and coffee, numerous ferns and cacti, and a towering bird of paradise. The children’s response to our science facility has been wonderful: I receive a steady stream of questions and information about any and all activities and changes they observe. Feeding time is always special: it is never routine when, in the blink of an eye, our chameleon extends his 25-centimetre-long tongue to capture a cricket. They are thrilled that we have our own banana plant! They have seen our bird of paradise plant grow from a modest height of just under a metre to a towering giant with its huge leaves pressing against the three-metre-high ceiling of the solarium. Students realize that although plants may not move they are not boring. In fact, the plants are almost as popular as the animals: when allowed to use free time many students request time in the solarium. Interacting with unusual species makes the students feel as if they are part of something very special: this is not an ordinary “goldﬁsh” sort of experience! Each species tells a story that the students can learn from and relate to, whether it is locating its origin on a world map, or making comparisons to a similar or related species that lives in our own bioregion. The simple routine of personally witnessing the diversity of living organisms establishes interest and concern for the natural world, and fosters stewardship of the environment. Organisms don’t have to be alive to generate strong interest. A wide assortment of specimens, including scorpions, tarantulas, and sea horses, are available in clear acrylic blocks. These student-friendly blocks are indestructible and excellent to use with magnifying glasses. Student safety in the room has not been a signiﬁcant issue. All of our plants are typical houseplant varieties and seeds used for planting are pesticide free and safe. 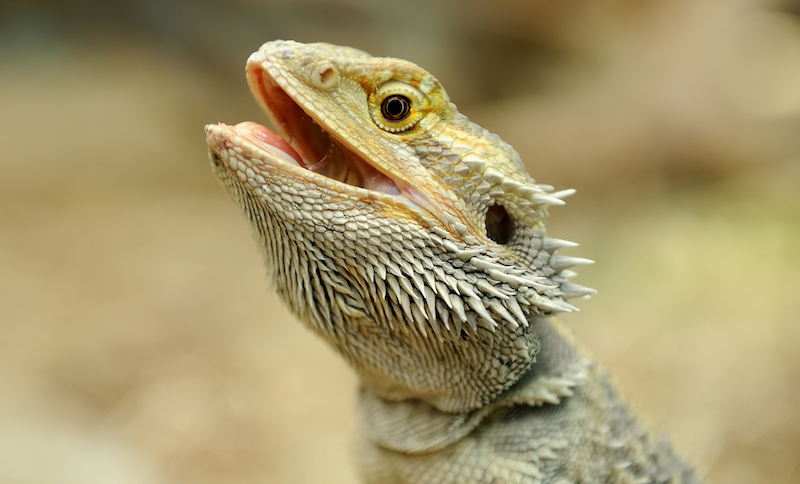 Furred and feathered animals such as dogs, cats, and parrots can raise serious allergy concerns but the skin of reptiles and amphibians does not trigger a similar response. Similarly, ﬁsh aquaria do not pose a signiﬁcant health concern as long as students look but don’t touch. There is little doubt that children are interested in science and willing and able to learn. We can foster their interest and enhance their learning opportunities by providing rich classroom environments. Living organisms and hands-on specimens are among the most dramatic and engaging additions you can make. However, you don’t need a room full of creatures: consider adding a single aquarium or terrarium and one or two healthy living plants to your classroom and obtaining interesting specimens. Ask for support from your principal and board. If you are willing to put the effort into enhancing student learning, you deserve their support. Kramer, Judy, and Carina van Heyst. “Out & About – An Environmental Unit for Grades 3 and 4.” Winter 2001. Stonehouse-Kish, Marietta. “A School Yard Restoration Project.” Fall 2001. Telfer, Cory. “Provincial Parks Bring Life to Learning.” Summer 2003. Armstrong, Audrey. “Teaching and Learning with Monarch Butterﬂies.” Summer 2005. Noting the interconnectedness of climate justice and social justice, Kim Fry argues for solutions and economies that have a human- and nature-centred approach to development.